Far from the doorstop of European policymakers, and even further from their recommendations and policies, Zborov rests in a valley of farmland and forest. 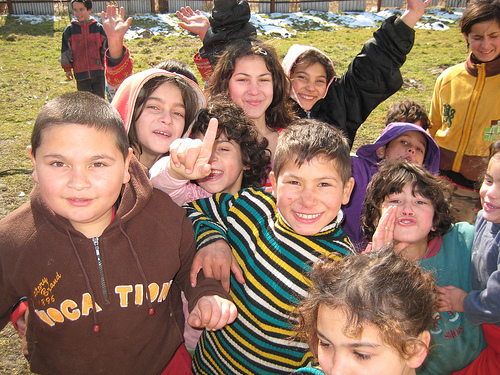 In its Romani settlement, children of all ages play among improvised housing and new units funded by PHARE. Avoiding a deflated football kicked around outside and holding a book to his chest, Mikey joins over a dozen children gathered in the central room for an informal school lesson at his house. Mikey’s mother Eva helps the children read aloud and practice their Slovak. Since most Romani children like Mikey speak Romanes as their mother tongue in this part of Slovakia, language learning is a top priority for mothers like Eva. Poor language knowledge is the number one excuse to funnel Romani children like Mikey into special schools for children with learning disabilities – an institution that has been used to segregate children like him, cutting them off from basic learning milestones in literacy, numeracy and basic hygiene. Segregation – illegal and judged discriminatory in the groundbreaking European Court of Human Rights decision D.H and Others v. Czech Republic in 2007 – in public school systems can be encouraged through a system of distorted incentives to schools and teachers that inevitably deny Romani children access to the best quality early childhood education and care. They may be placed them in classrooms with little or no emphasis on learning or the critical and practical skills needed in any contemporary workplace. Whether culturally-biased testing, punitive teaching, or overwhelming financial obstacles that stop the poorest families from sending their children to school, Romani children and youth face uncertain prospects, with graduation rates from primary school hovering around 20 percent due to a lack of numeracy and literacy at the crucial juncture of fourth and fifth grades. For higher education, the figure is less than one percent. The response of the majority, and the teachers, administrators, local officials, and policymakers that represent them, has been to shrug, condemning poor children like Mikey to have no chance for advancement, much less steady employment, life-long learning, or any of the opportunities that most majority societies demand and expect. Lobbying recently at the EU on the behalf of quality early childhood education and care for Romani children under age eight, the Roma Education Fund is fighting to put this key component on the screens of EU policymakers and budget planners currently deliberating the final shape and amounts of the 2014-2020 EU budgetary period. Through the mechanisms of the European Structural Funds, large amounts of money have been earmarked for social inclusion projects; some of the most ambitious and successful projects targeting large numbers of Roma have been implemented on a large-scale in Spain. Yet the EU insists on running pilot projects reaching a tiny amount of beneficiaries when there may be well over a million such Romani children in need in the new member states in Eastern Europe, not to mention numerous examples of what makes a positive difference to Romani’s children attendance and achievement. Quoting the overwhelming international evidence of the smart investments that can be made in early childhood education, and already leveraging a substantial amount of money from a consortium of international donors, the Roma Education Fund has spent the last five years prying open the policy debate in the region and insisting that the EU (as well as national and local governments) take action on a long-term and ambitious scale. Proven efforts pioneered by the Roma Education Fund and a cohort of similar NGOs do nothing that is overly expensive or new: place Romani mediators in the community to educate parents, reach out to Romani mothers through reading and literacy programs, ask Romani parents to teach a lesson to their children, bringing them closer to the schools, add Roma teaching assistants to integrated classrooms that teach together all children, provide maintenance scholarships and mentoring to students who reach secondary school, and so on. There are many solutions that have made a difference, but without the tacit support of national and local governments, NGOs can only improve the lives of a few. Despite the best intentions of the EU’s communiques, strategies and expert groups, the major obstacle to achieving any of this is the EU’s limited mandate. A well-kept secret, the EU is powerless as any such implementation hinges on the cooperation of the Structural Funds’ national managing authorities and the willing participation of the respective member states, which for political gain often prefer a stalemate rather than appearing to favor Romani families who have borne the brunt of the fallout of the economic and social instability in Eastern Europe for the last two decades. For children like Mikey about to be swept under the carpet by their education systems, there is a perilous road ahead, but not one without progress if given the right mixture of care, attention, and investment that will undoubtedly repay those authorities that choose to invest. The choice belongs to governments: pay the penalty later as an overwhelming wave of children enter working age with no skills, no prospects, and no way out. Or invest now in Romani children, anticipating the new allocations that will be dedicated to social inclusion in the EU’s new 2014-2020 budget thanks to efforts of NGOs like the Roma Education Fund.